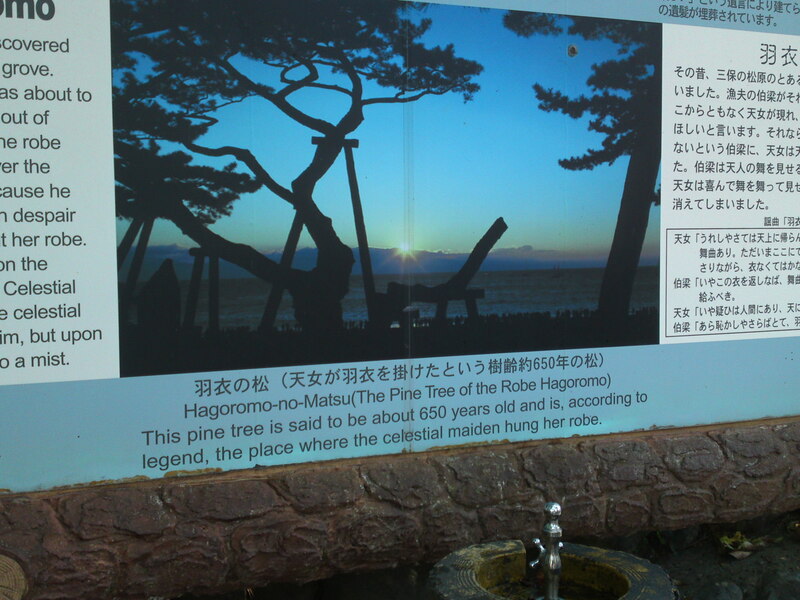 The Legend of Hagoromo in Miho Beach Pine Forest, Shimizu Ku, Shizuoka City! 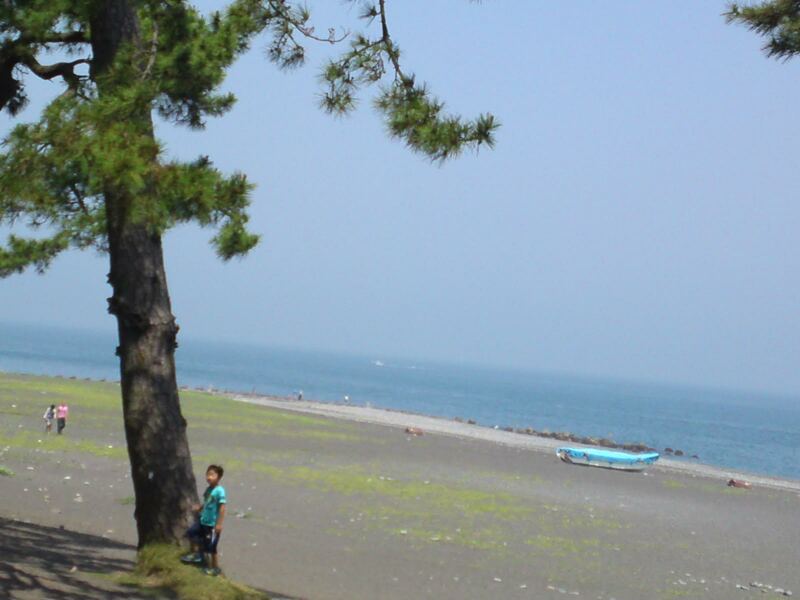 The Peninsula of Miho and the Beach of Matsubara have become a World Cultural Heritage in the company of Mount Fuji in recent times. 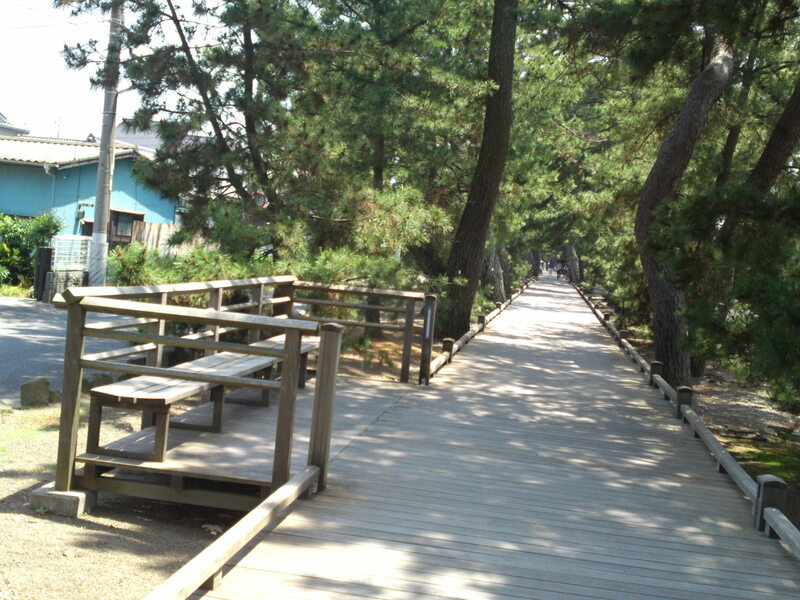 And the very Matsubara beach with all its pine trees as it name indicates is the home of a very ancient and famous legend all over Japan: The Legend of Hagoromo! 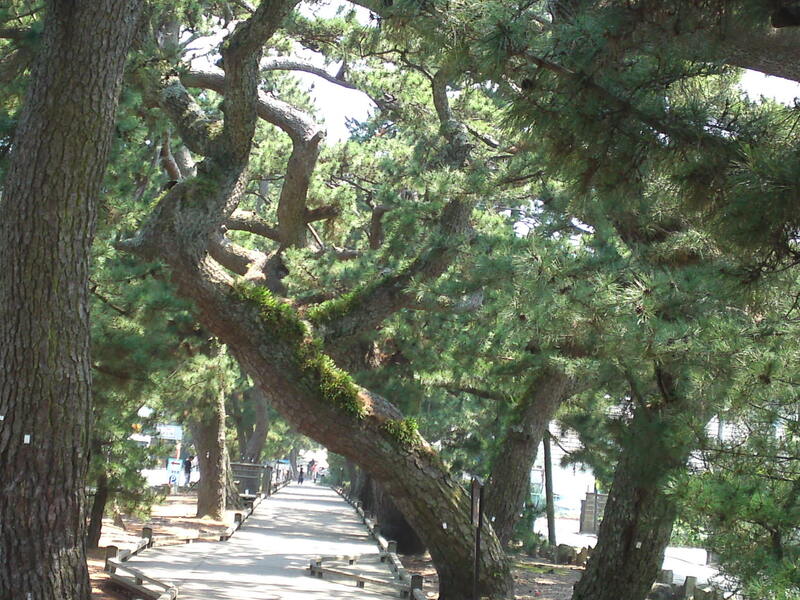 If you are not one of the visitors coming in one local bus or a crowded tourist coach take the time to enter the forest past the big shinto torii gate and walk along a wooden path! 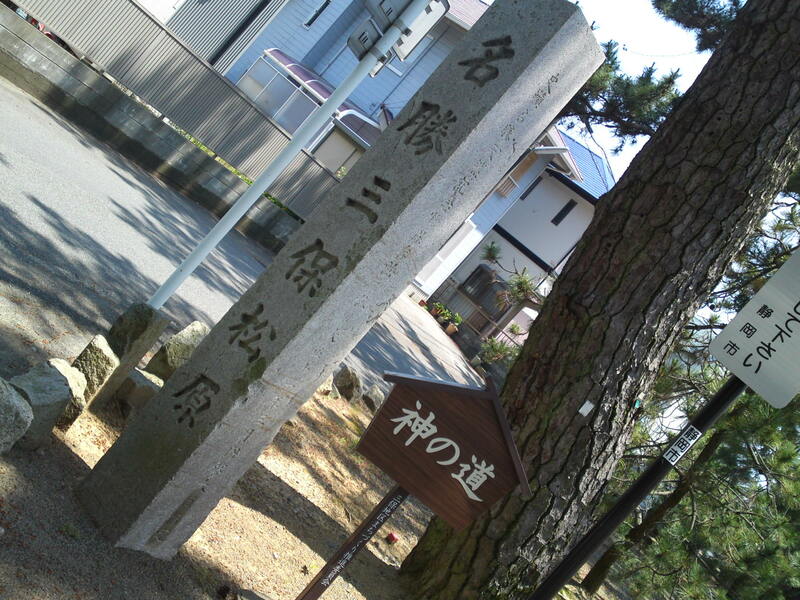 The monument marking the entrance of the “Path of the Gods”! 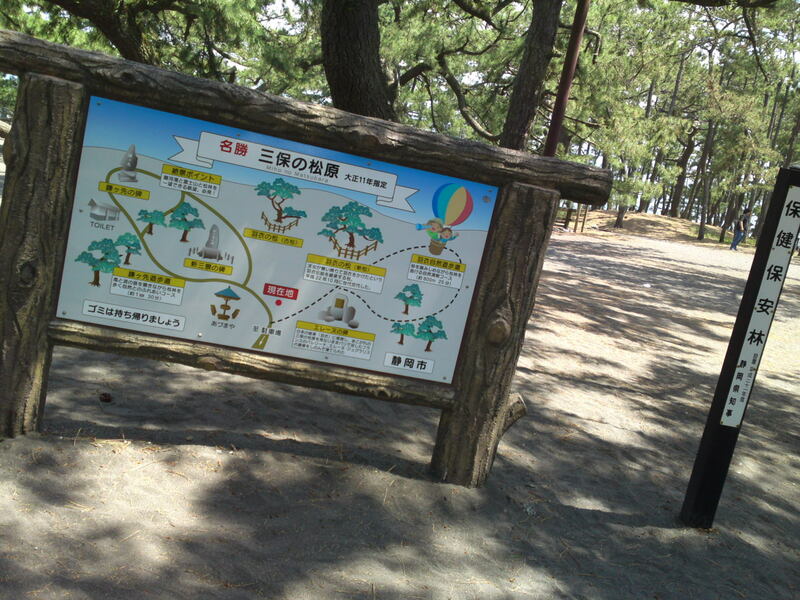 Take your time and take a rest if need be! 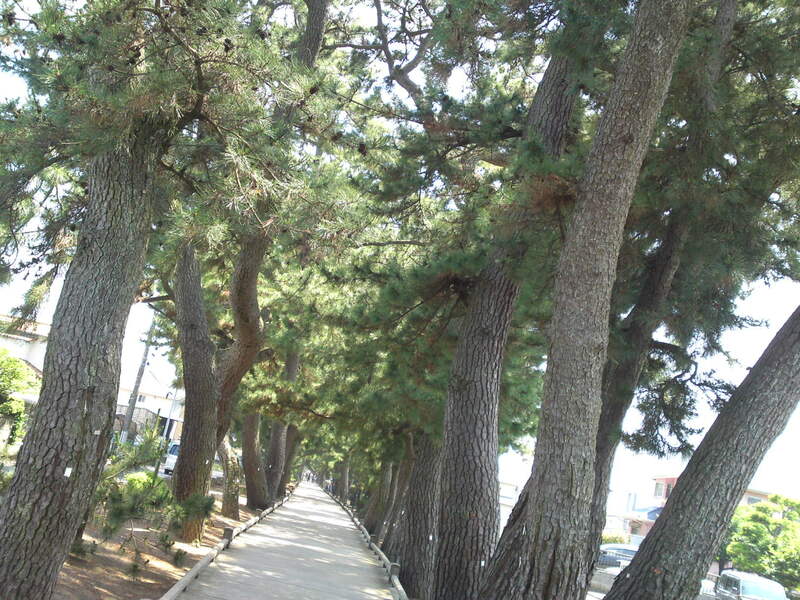 The whole path is lined with venerable pine trees! 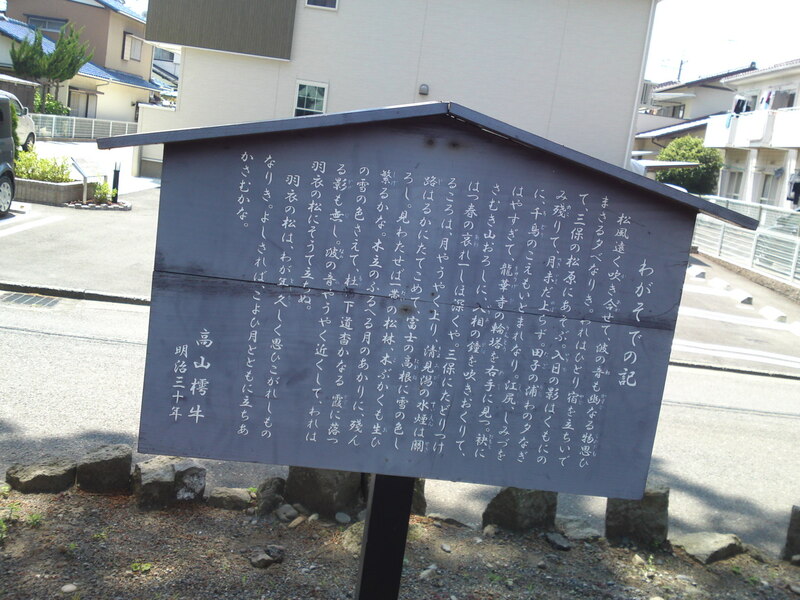 The place and its legend was already mentioned in the “Wagasode Journal” written in 1899! 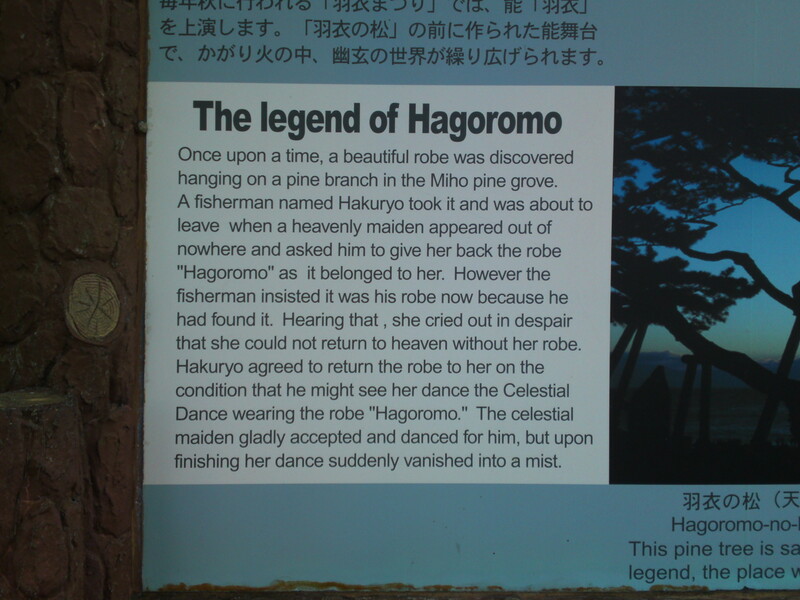 Naturally the Legend of Hagoromo is also explained on the same type of traditional Japanese announcement board but I will be able to explain in detail with pictures soon! 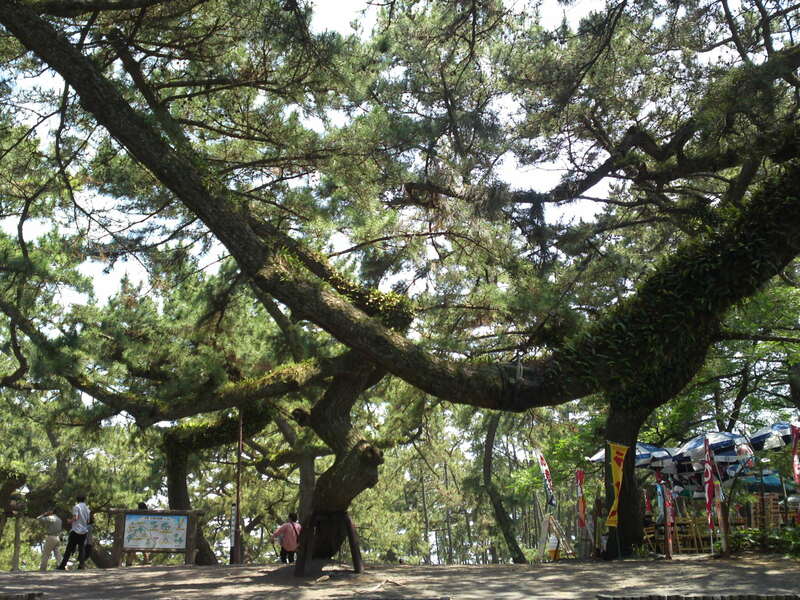 An incredibly shaped pine tree! 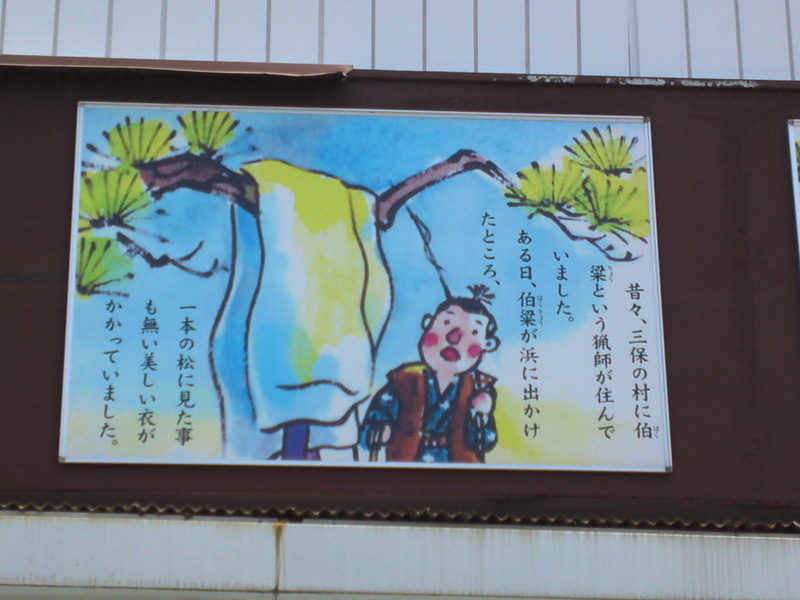 “Hagoromo/羽衣” means veil or garment. One day a local firsherman discovered a veil hanging on a low branch of a pine tree. Just as the fisherman was going away with the veil a lady deity appeared and told him it was her veil and to give it back to her. 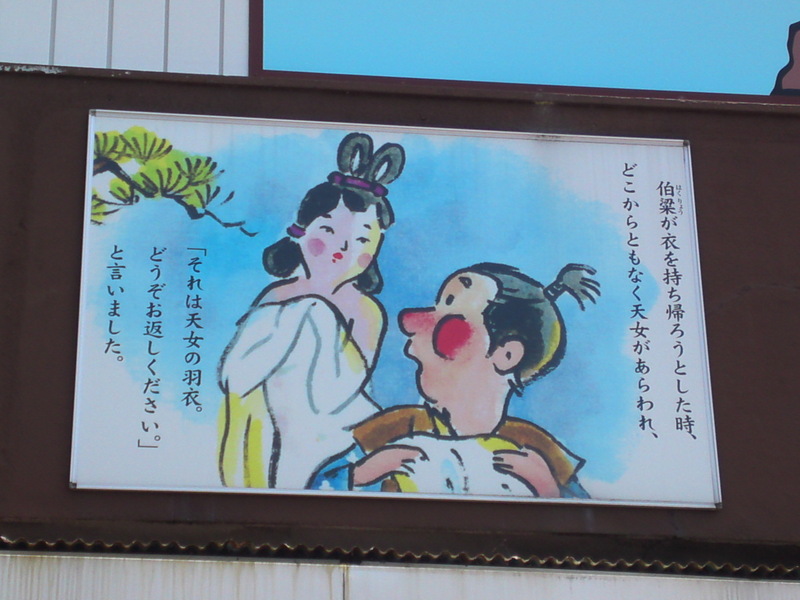 The fisherman asked for a dance in exchange for her treasure without which she wouldn’t be able to go back to heaven. Playing on her lute she performed the “Dance of the Moon. 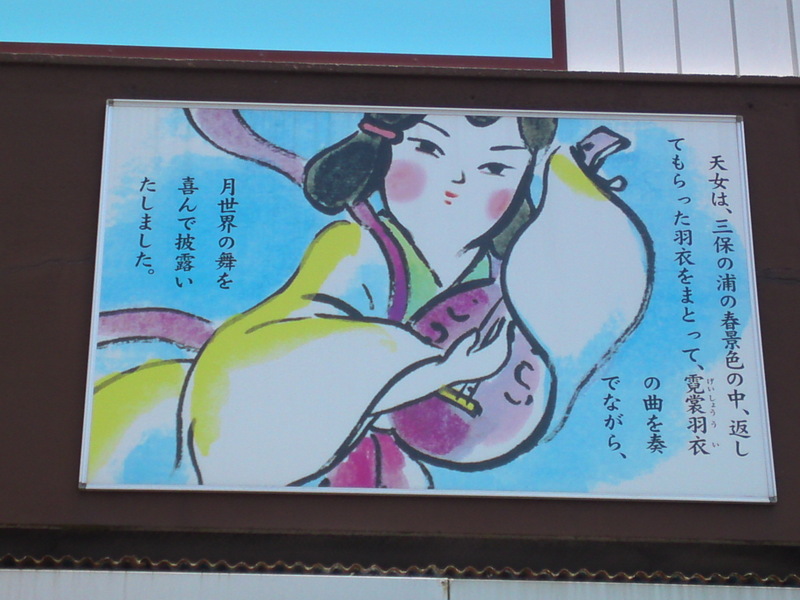 But after the fisherman returned her veil she disappeared in the sky! 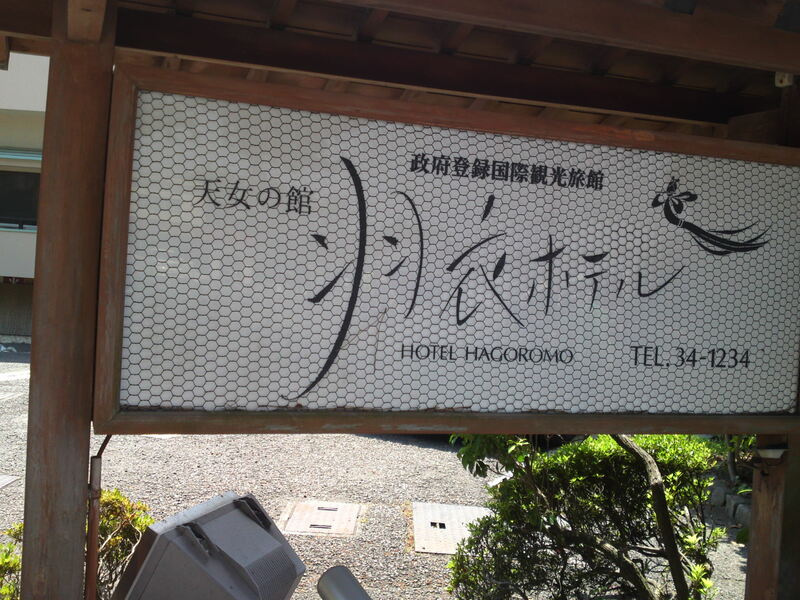 You will find a Hagoromo Hotel by the entrance of the pine Forest! 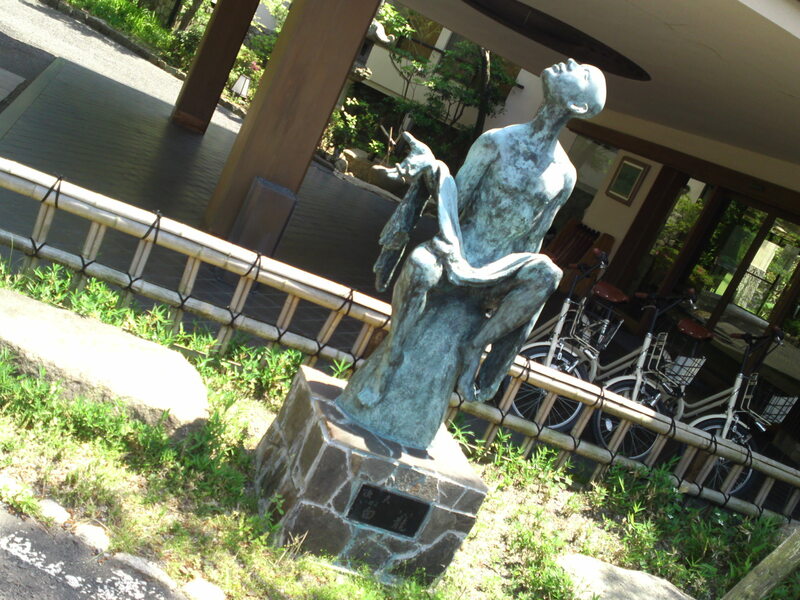 Naturally the hotel has a statue commemorating the legend! 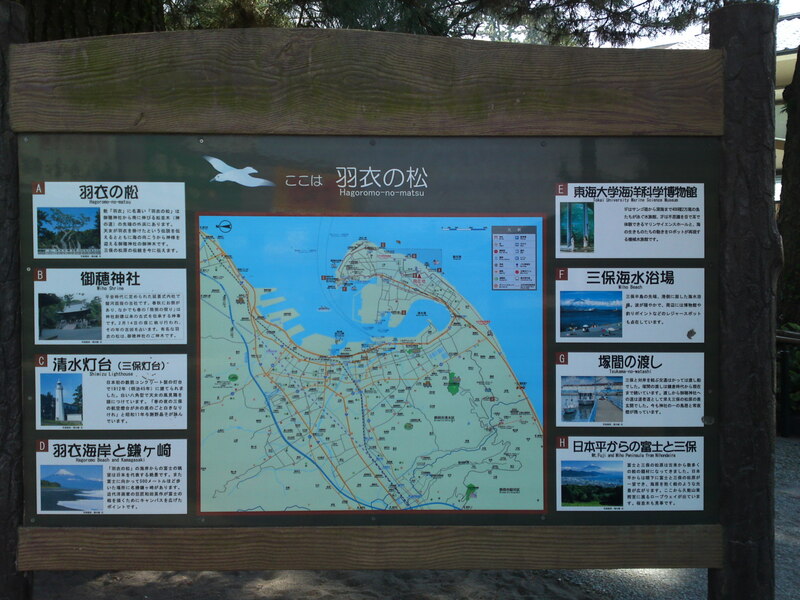 There are also bilingual boards at the entrance of the pine forest! 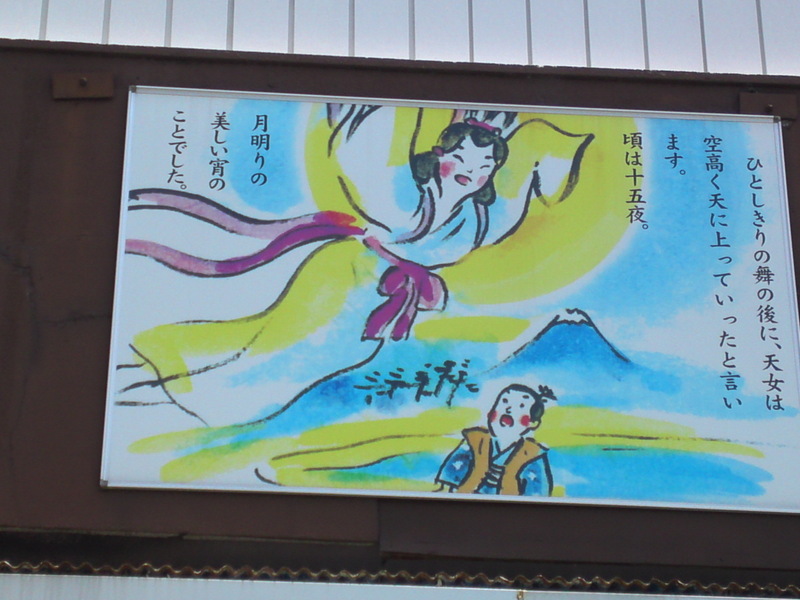 Every year a Traditional Noh Theater play is performed inside the forest to relate the legend of the Celestial maiden and her veil. 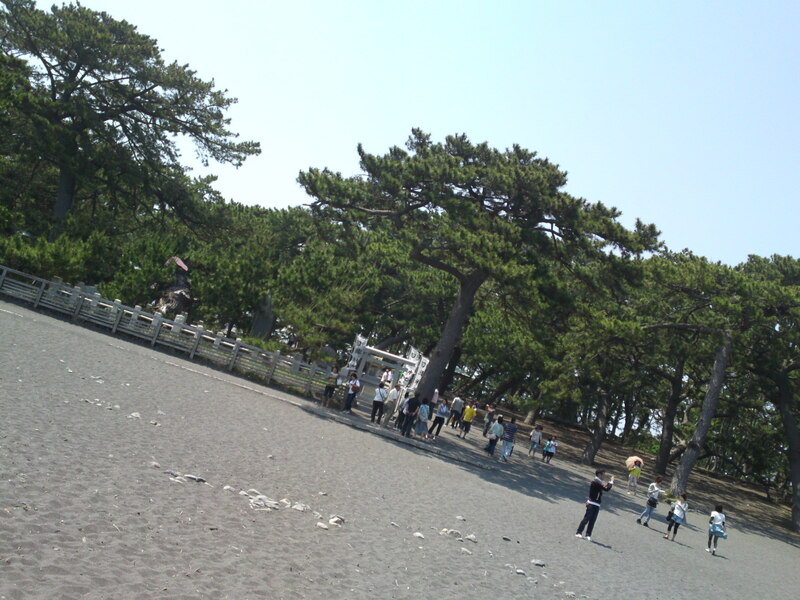 The legend says that the pine tree is 650 years old! 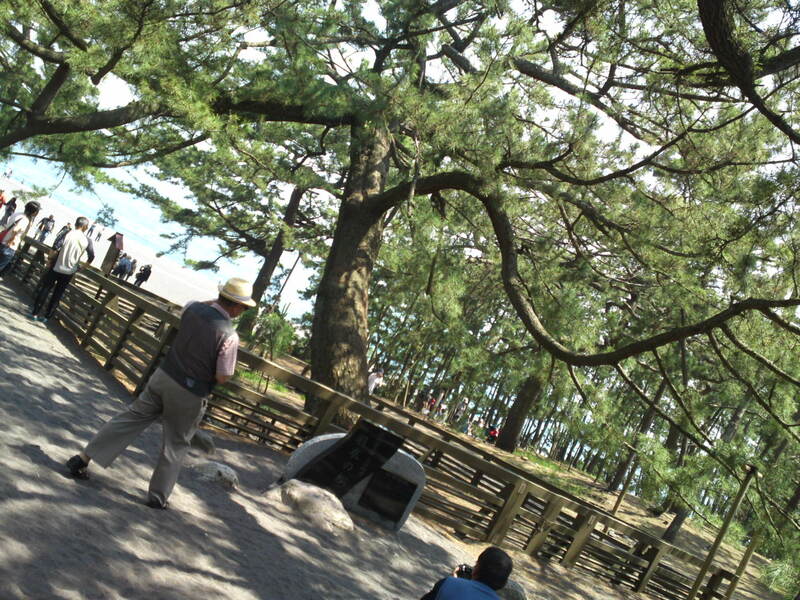 The very tree and its low branch! 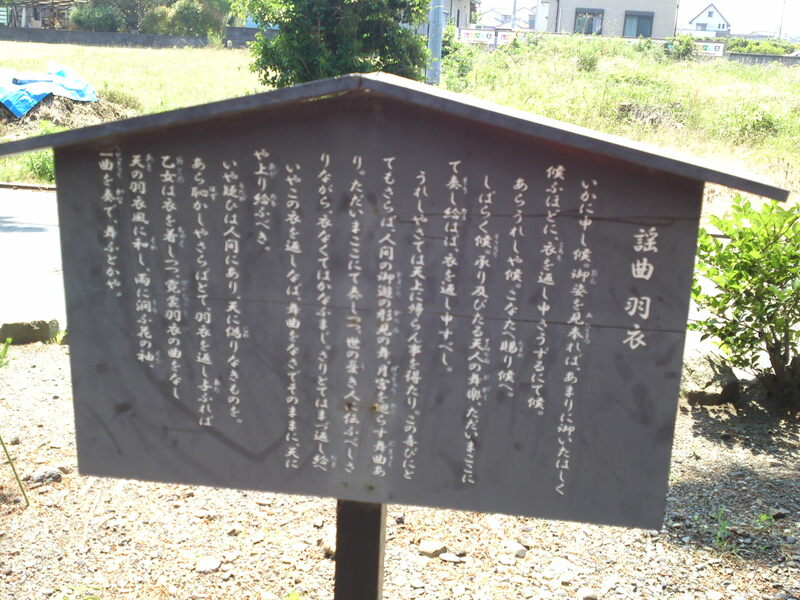 More information but only in Japanese! 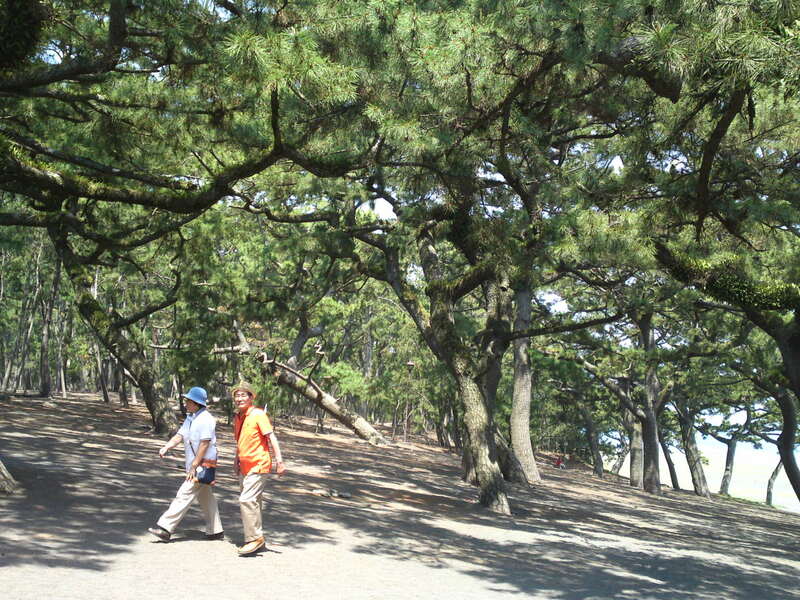 The Matsubara Pine Tree Forest! 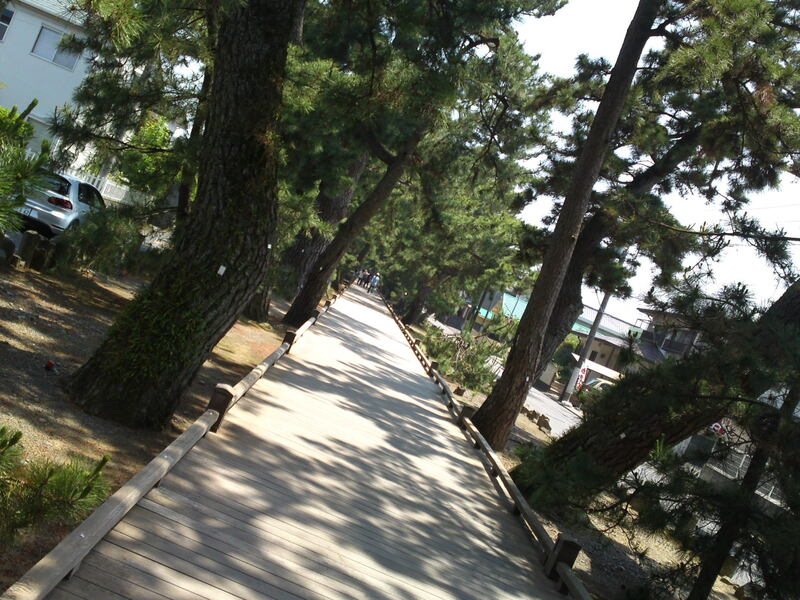 The Noh play takes place there! 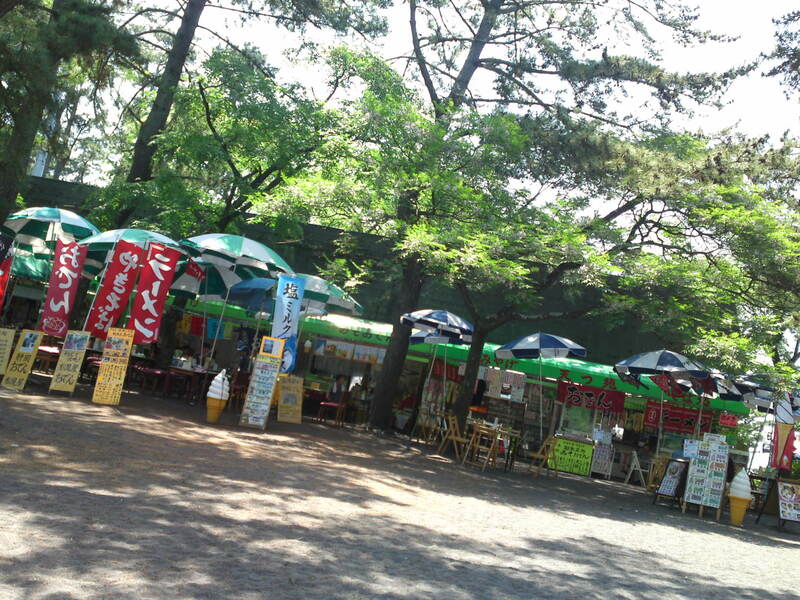 Don’t worry, there are plenty of shops for food and refreshments and facilities! 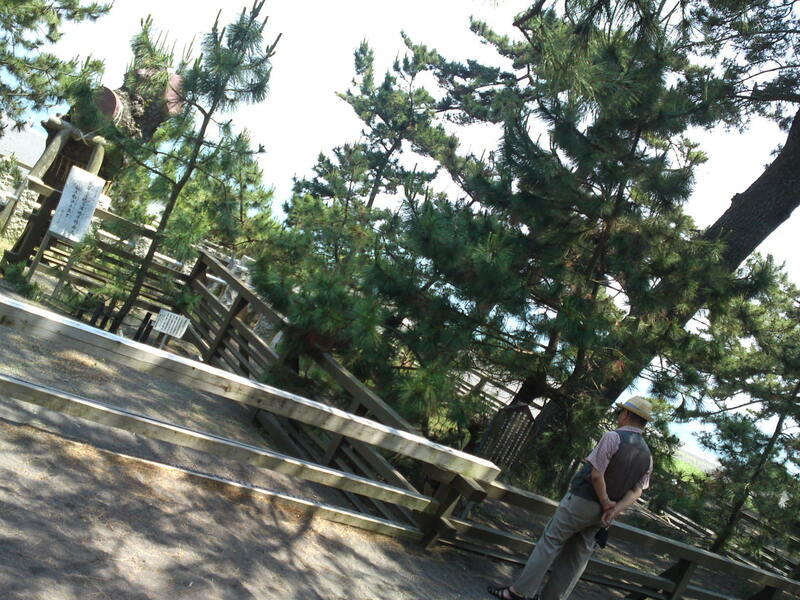 Visitors come from all over Japan! 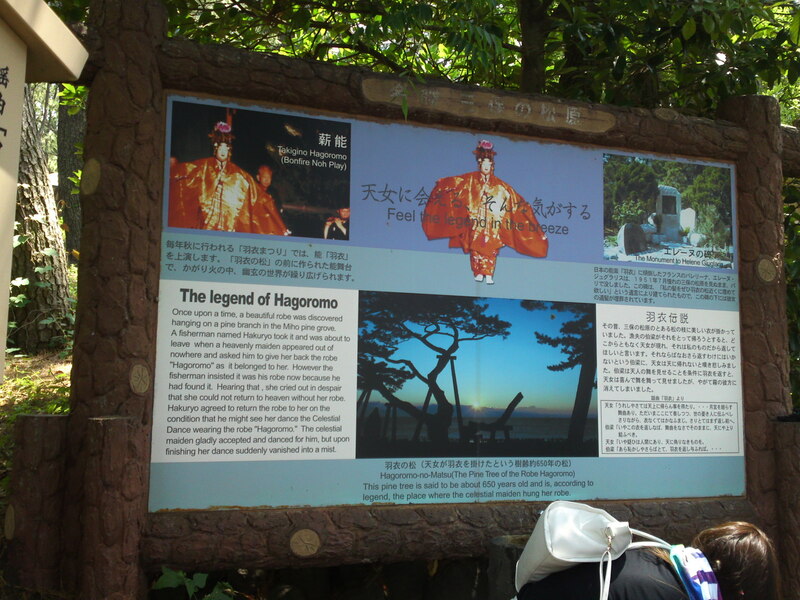 The forest has it own minuscule shrine called “Haguruma”! 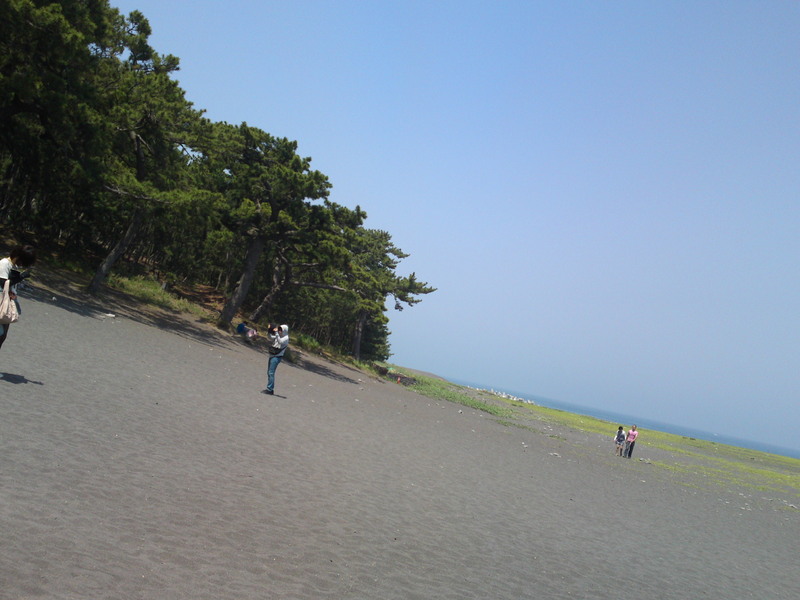 Many people of course visit the beach! During the colder part of the year you can enjoy an incredible view of Mount Fuji, but that will be a report later in the year! 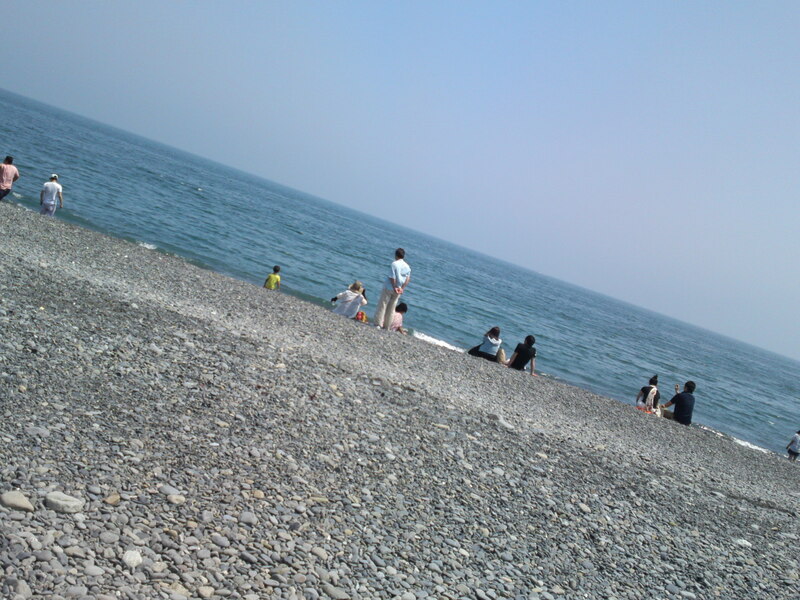 But it is still too early for the bathing season! 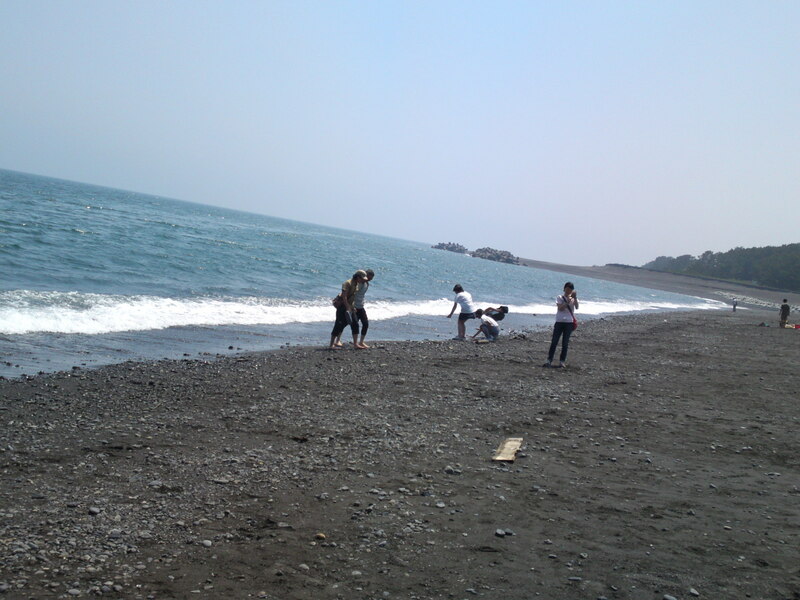 But of course you may play on the beach as much as you want! 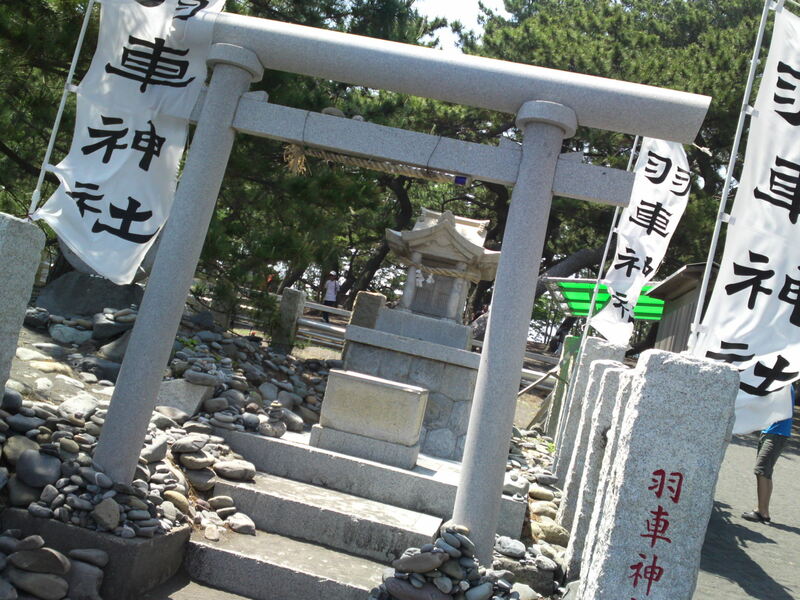 Previous PostMiho Shrine (美保神社) at Miho (美保) in Shimizu Ku, Shizuoka City!Next PostPlane, but not a “Zero”, along the Warashina Riwer, Shizuoka City, Aoi Ku, Tomizawa!